Libby Pritchett Designs: Who's ready for Libingo!?! 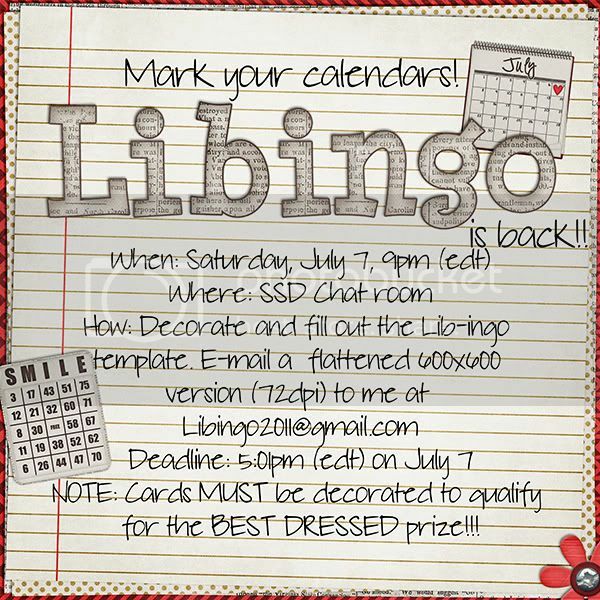 Join Leila & Kristin in the chat room on Saturday, July 7 at 9pm EDT for Lib-ingo!! Lots of fun and prizes to be had...including one for best dressed bingo card! Just click the image above to download and decorate your card! Deadline is 5:01pm EDT on July 7. Cards must be decorated to be eligible for the BEST DRESSED prize!! Thank you so much for this post. I want to let you know that I posted a link to your blog in CBH Digital Scrapbooking Freebies (please, notice the new url for my blog), under the Page 2 post on Jul. 03, 2012. Thanks again.